As an industry leader, Precision Vapor Barriers offers the services you need to keep the crawlspace of your mobile or manufactured home moisture free. Precision Vapor Barriers offers vapor barrier replacement, insulation repair, site leveling, hurricane strapping and anchoring as well as faulty duct and floor inspections. Precision Vapor Barriers is here for you and your home. Precision Vapor Barriers provides a 20 yr transferable warranty on all our work and materials. 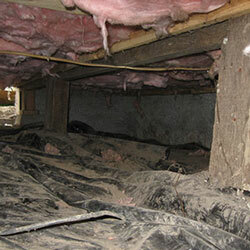 A friendly Precision Vapor Barriers professional will inspect the crawlspace of your mobile or manufactured home. This inspection will include searching for damage to your existing vapor barrier, damaged insulation, damaged air ducts, damaged supports, damaged boards and damaged beams in the floor. This free* inspection and barrier estimate is designed to let you have peace of mind and inform you on the most sensible approach to take, if any. One of the leading monthly costs of operating a home is its energy costs. Since every mobile or manufactured home is elevated to some degree, poor insulation of the floors are one of the largest contributors to higher energy costs due to lack of efficiency. This is also a contributor to unnecessary wear and tear on your AC or heater. Precision Vapor Barriers can replace your old, worn, or damaged insulation with a new, thicker and more energy efficient insulation. So you can begin to live more comfortably and start saving money. A torn or unsecured vapor barrier can cause moisture to invade the underside of your mobile or manufactured home. 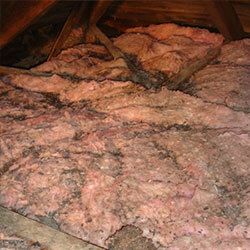 Over time, this can lead to a series of issues that can damage your home. Moisture can weaken or ruin the wood beams and supports under your floor. This can cause unsightly and often times dangerous soft spots in your floors. If left untouched those soft spots can become holes. Let Precision Vapor Barriers guide you on how best to reinforce your floor to eliminate those soft spots. The Precision Vapor Barriers team can ultimately inspect and guide you on the best path to take if it is found that your floors do need strengthening. Your mobile or manufactured home can be prone to settling and this can cause serious issues if not corrected. Precision Vapor Barriers is here to make sure that if a leveling issue presents itself, you are in good hands. Upon inspection of your home our service professional will check that your home is straight and level. If an issue does present itself, rest assured that our Precision Vapor Barriers professionals are licensed and qualified to get your home level again. 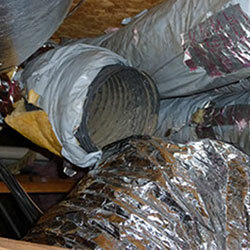 A torn or damaged air duct can affect the liveability and expense of your home and cause strain on your AC or heater. Allow Precision Vapor Barriers to give your home a free* and easy under home inspection. If any issues are found, the team at Precision Vapor Barriers is well prepared to guide you on any duct work that may need attention. A vapor barrier by Precision Vapor Barriers is one of the best ways to ensure your mobile or manufactured home stays free from hazardous, and often times deadly molds. A vapor barrier by Precision Vapor Barriers is also a wonderful way to help ensure your home is free from pest infestations. A vapor barrier when used in conjunction with new insulation, is one of the most effective tools a home owner has to regulate the homes temperature by increasing efficiency. Let the Precision Vapor Barriers team get your home “dressed for success” by installing a quality, durable, long lasting and warrantied vapor barrier. It is necessary to have a proper vapor barrier in Florida due to the high levels of humidity. It is important to have a durable, long lasting and properly installed vapor barrier under your mobile or manufactured home. Without a vapor barrier the levels of moisture can be so high that you may be breeding molds and housing pests like roaches or mice. 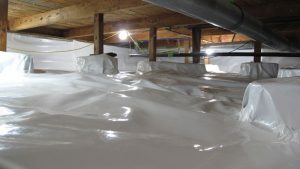 The qualified team at Precision Vapor Barriers can help reduce moisture my installing a dehumidifier to your newly sealed crawlspace vapor barrier. Precision Vapor Barriers is your trusted industry leader in mobile and manufactured home anchoring and strapping. A robust anchoring system is a must due to Florida’s propensity for high winds and frequent hurricanes. Let Precision Vapor Barriers inspect your mobile or manufactured homes anchoring system as part of its free* inspection and estimate. 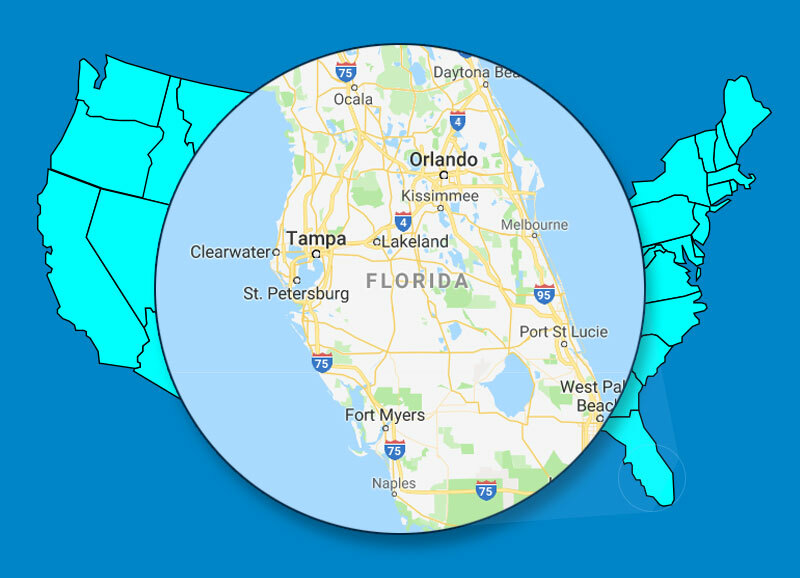 With Precision Vapor Barriers anchoring and strapping professional services, you can rest assured that your mobile or manufactured home remains where you left it!